Payoneer serves millions of corporate payers, most notably Google, Amazon, Airbnb, and Upwork. Cross border transactions solutions always represent huge opportunities for growing businesses, as well as a tremendous amount of risk. While companies in the B2C payment sector such as PayPal, Skrill, and other well-known providers get the most media attention, e-commerce has accelerated the trend of cross-border B2B commerce. Founded in 2005, Payoneer started as a prepaid card company that provided online cross-border payment services, but later it recognized a broader set of trends that were shaping the B2B world and B2B payment needs. Today, the firm enables millions of businesses and professionals to reach new audiences by facilitating seamless, cross-border payments with an array of flexible payment methods, including local bank transfers and in-network payments, and a wide number of added services, like risk monitoring, regulatory compliance, and tax form automation. Further, the New York City-based company is now able to offer escrow-as-a-service (EaaS) after its latest acquisition of Armor Payments. In a bid to better make sense of global cross-border e-commerce, Finance Magnates spoke with Payoneer CEO Scott Galit to get his take on the company’s launch into the UK market, Brexit impacts on digital payments arena, and what’s next for Payoneer and the industry at large. To get started and give our readers who may not be familiar with the company a little bit of background, how would you explain Payoneer’s business? Payoneer is a cross-border B2B payments platform that empowers business and professionals all over the world to pay and get paid globally, as easily as they do locally. The company was founded in 2005, and since then, we’ve grown to support customers from over 200 countries and territories, transacting in 150 currencies. Payoneer’s customers also benefit from a wide array of complimentary services, including an incredibly robust and developed regulatory compliance and risk monitoring platform, and new functionality like the automated tax form service, online payment management, and more. Did you choose to get into the B2B side of payments, as opposed to B2C, from the beginning, or was this something that evolved over time? And do you believe that there are attractive advantages for B2C businesses globally that could attract attention and investment away from the B2B side? By the way, we have a similar dilemma here at Finance Magnates. At the beginning, we were a hybrid between B2B and B2C. We straddled the two worlds to some extent. We were focused on selling payout solutions to marketplaces to help them make global payments, but the vast majority of the payments we were helping them make was to individual sellers and service providers. There were a number of directions we could have gone as we evolved. Ultimately, we saw that the biggest problems we were solving were the incredible challenges involved in cross-border B2B payments. A new business model had been brought about by online marketplaces and the expansion of the digital universe. For the first time, third-party marketplaces had created global opportunities at a scale that had never existed before. Consumer remittance had been a problem for a long time, but the internet had opened the ability for professionals and small businesses to sell outside of their home markets in ways that weren’t possible before. It created a massive problem for B2B payments. Over time, we focused our resources and continued to invest more on the B2B side. We have never been a B2C company, but there’s certainly still part of our business that’s for individual professionals. Payoneer has grabbed B2B startup Armor Payments to create a global B2B money transfer network. Does this signal a larger acquisition strategy for the company, and is your way ahead going to be more as an acquirer than as a developer of new innovations? We’re building a unique global platform at Payoneer. This has necessitated the creation of a significant cross-border infrastructure, which has developed both organically and through acquisitions. We see the opportunity to make strategic acquisitions and form key partnerships as a means to more quickly address new customer segments and needs. That said, we’re also investing absolutely massive amounts in growing our organic capabilities. Over the next couple of years, we’re more than doubling our technology and product teams. Who uses Payoneer and how large is the client base? Please mention some of the most notable clients that the company has, and what are your strongest selling points? 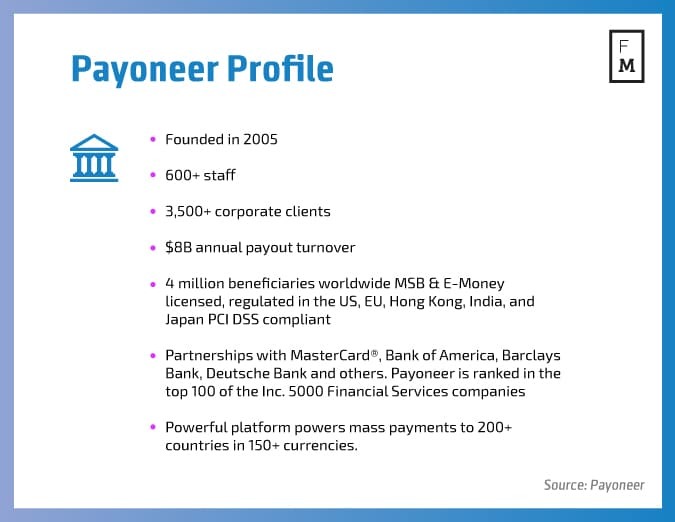 As I mentioned, Payoneer has two groups of customers – the companies that we enable to make payments globally, and the small businesses that are using Payoneer services to get paid by their clients. Today, we service millions of small business customers and tens of thousands of corporate payers, most notably Google, Amazon, Airbnb, and Upwork. For our marketplace clients, our biggest selling points are our global reach, incredibly robust compliance and risk capabilities, a simple API integration, tax form automation services, and the ability to tap into our Payoneer ecosystem of small businesses, sellers and service providers all over the world. For our small business customers who are receiving funds, we offer instant payments from our network of corporate payers, and for those sending cross-border B2B payments, our unique global billing service makes it as easy as sending local ones. Every Payoneer offering comes with: fast payment delivery times; flexible payment methods; 24/7 customer support in 35 languages; low prices; and an incredibly powerful Payoneer Account that allows them, among other things, to track the status of their payments and make in-network payments for free. Do you expect to see a fundamental change in the way payments are made in the next three to five years. What do you think is the next major goal for the industry at large, and where does Payoneer fit in to this? Consumer payments have been the focus of innovation in the last decade, as the internet, and mobile, and technology in general have created all kinds of platforms aimed at selling to consumers. As a result, we’ve seen significant evolution in this market. The B2B world, however, was slower to come online than B2C. In recent years, we’ve seen B2B businesses of all sizes, all over the world, trading with each other. This type of cross-border activity is happening in very large numbers and at a very fast pace, yet we haven’t seen the same type of technology innovation in business payments. So, I think we’re in the early days of remaking the B2B infrastructure in a way that will digitize payments and accelerate them, the same way consumer payments have gone digital. Today, the idea of a consumer in one country buying from a business in another country, both using their own currencies, is commonplace. In the coming years, we see B2B transactions, and the accompanying infrastructure, following the same route. Now everybody talks about a new and different world to come. I’d love to know how do you get your culture to be in the lead of that new world while you are fighting in an incredibly crowded battle ground with many competitors, whether they’re traditional banks or successful startups, and lately incredible large companies. At Payoneer, we believe company culture is our single greatest competitive advantage. In a world of constantly changing customers, technology and competition, culture is the only constant, the only thing that that can remain universal. We hold this idea dear in the face of the evolving world around us. If we cultivate a strong, supportive, and resilient culture, if we have people here who reinforce it, and if we give those people the opportunity to make it a real and living thing every day, then it becomes self-reinforcing. It’s not a guarantee that we will succeed. But regardless of what comes, we will have people who feel connected to the rest of their team and to our mission to empower our customers around the world, who feel a sense that they should feel comfortable even as there’s change and obstacles. The foundation has to be firm and grounded in something shared with everyone else here. The main vision for our corporate culture is one that makes people feel comfortable pushing against the status quo, even if it means occasionally making mistakes. We need a culture that’s self-questioning. If the culture becomes one of constant self-assurance and praise, then the first time a competitor bests you, you feel embarrassed. Rather than evolve, you turn a blind eye, or regress. For that reason, we believe humility is key. What makes us succeed today, what feels great today, may be irrelevant tomorrow. If we start getting full of ourselves for any reason, that’s a sign of danger. If we instead have smart, caring people who are willing to ask the hard questions and take chances, more often than not, we’ll succeed. A Brexit could jeopardise the UK’s status as the major financial gateway for Europe even if the impact is ultimately light, as prolonged uncertainty could create a vicious cycle harming the UK’s position. In addition, it is certain that the UK will lose its powerful voice in the establishment of European regulations— and this cannot be positive for any financial sector including the cross-payments realm. Did you consider this fact? Laws and regulations evolve. Sometimes it’s because of a vote, or because a regulator wants to introduce new legislation. We see regulations as both necessary and valuable, so we continue to make regulatory investments to offer the services we want to offer in key markets around the world. As part of our business, we change and evolve to meet legal requirements. That’s crucial when conducting business in a global and digital world, where regulators are constantly looking for ways to both protect and enable businesses to compete. For us, the Brexit vote may have some effect on our cost structure…or not, depending on what happens. There’s still too much uncertainty to know for sure. But what we do know is that we’re committed to compliance, we’re committed to both the UK and Europe, and we have the resources and will to work through it. Payoneer serves businesses that are trading internationally. We look around and we see more opportunity and more new channels, not less. We’re simplifying access wherever possible. Part of our commitment to our clients is to let them trade wherever they want to trade in a secure and compliant way, regardless of changing laws and regulations. Finally, could you tell us about some of the upcoming milestones you have for Payoneer? Any plans to introduce new services in 2016? Here at Payoneer, we’ve very aware of the challenges businesses have in growing globally. To help ease those burdens, we’re making huge investments in product and infrastructure. That’s why we made the Armor acquisition, and why we’ve recently rolled out services for automating supplier tax form management, and a functionality that allows users to easily make a payment within the Payoneer network. There are a number of other financial needs that businesses have that we think can be addresses in new and better ways than they can be today – you’ll have to stay tuned to Payoneer to see what we have coming out next! Your Company is still cheating on me! They called me to tell me that they would reverse the charges of some payments to my supplier on my credit card and they did not! So they continue to be scammers. They have no shame to defraud people with their nefarious and poor procedures professionally and ethically. I will initiate a complaint against you in INTERNATIONAL VISA for fraud. I wish to report fraud on the part of the Company Payoneer that is robbing the users of the credit cards, retaining amounts unduly for long periods, not accrediting the amounts deposited by alleging monetary policies that do not exist. They find themselves using MasterCard or Visa name when what they are doing is a fraud with the money they are given. In my possession all the documentation so that they can initiate the corresponding investigation.